These highlights do not include all the information needed to use Sumavel DosePro safely and effectively. See full prescribing information for Sumavel DosePro. Sumavel DosePro: 4 mg or 6 mg prefilled, single-dose, needle-free subcutaneous delivery systems. The maximum single recommended dose of Sumavel DosePro for the acute treatment of migraine or cluster headache is 6 mg given subcutaneously. For the treatment of migraine, if side effects are dose limiting, a lower dose (4 mg) may be used [see Clinical Studies (14.1)]. For the treatment of cluster headache, the efficacy of a lower dose has not been established. Sumavel DosePro is available for use as 4 mg or 6 mg needle-free delivery systems. It is intended to be given subcutaneously only. Sumavel DosePro is designed for patient self-administration to sites on the abdomen or the thigh with an adequate subcutaneous thickness to accommodate penetration of sumatriptan injection into the subcutaneous space. Administration should not be made within 2 inches of the naval. Sumavel DosePro is not to be administered to other areas of the body, including the arm. Instruct patients on the proper use of Sumavel DosePro and direct them to use proper injection sites. Instruct patients to not use Sumavel DosePro if the tip of the device is tilted or broken off upon removal from packaging [see Patient counseling Information (17) and Instructions for Use]. Sumavel DosePro is contraindicated in patients with ischemic or vasospastic CAD. There have been rare reports of serious cardiac adverse reactions, including acute myocardial infarction, occurring within a few hours following administration of Sumavel DosePro. Some of these reactions occurred in patients without known CAD. Sumavel DosePro may cause coronary artery vasospasm (Prinzmetal’s angina), even in patients without a history of CAD. Sensations of tightness, pain, pressure, and heaviness in the precordium, throat, neck, and jaw commonly occur after treatment with Sumavel DosePro and are usually non-cardiac in origin. However, perform a cardiac evaluation if these patients are at high cardiac risk. The use of Sumavel DosePro is contraindicated in patients shown to have CAD and those with Prinzmetal’s variant angina. Cerebral hemorrhage, subarachnoid hemorrhage, and stroke have occurred in patients treated with 5-HT1 agonists, and some have resulted in fatalities. In a number of cases, it appears possible that the cerebrovascular events were primary, the 5-HT1 agonist having been administered in the incorrect belief that the symptoms experienced were a consequence of migraine when they were not. Also, patients with migraine may be at increased risk of certain cerebrovascular events (e.g., stroke, hemorrhage, TIA). Discontinue Sumavel DosePro if a cerebrovascular event occurs. Sumavel DosePro, may cause non-coronary vasospastic reactions, such as peripheral vascular ischemia, gastrointestinal vascular ischemia and infarction (presenting with abdominal pain and bloody diarrhea), splenic infarction, and Raynaud’s syndrome. In patients who experience symptoms or signs suggestive of non-coronary vasospasm reaction following the use of any 5-HT1 agonist, rule out a vasospastic reaction before receiving additional doses of Sumavel DosePro. Serotonin syndrome may occur with Sumavel DosePro, particularly during co-administration with selective serotonin reuptake inhibitors (SSRIs), serotonin norepinephrine reuptake inhibitors (SNRIs), tricyclic antidepressants (TCAs), and MAO inhibitors [see Drug Interactions (7.4)]. Serotonin syndrome symptoms may include mental status changes (e.g., agitation, hallucinations, coma), autonomic instability (e.g., tachycardia, labile blood pressure, hyperthermia), neuromuscular aberrations (e.g., hyperreflexia, incoordination), and/or gastrointestinal symptoms (e.g., nausea, vomiting, diarrhea). The onset of symptoms usually occurs within minutes to hours of receiving a new or a greater dose of a serotonergic medication. Discontinue Sumavel DosePro if serotonin syndrome is suspected. Migraine Headache: Table 1 lists adverse reactions that occurred in 2 US placebo-controlled clinical trials in migraine subjects [see Clinical Studies (14.1)] following either a single 6 mg dose of sumatriptan injection or placebo. Only reactions that occurred at a frequency of 2% or more in groups treated with sumatriptan injection 6 mg and that occurred at a frequency greater than the placebo group are included in Table 1.
a The sum of percentages cited is greater than 100% because subjects may have experienced more than 1 type of adverse reaction. Only reactions that occurred at a frequency of 2% or more in groups treated with sumatriptan injection and occurred at a frequency greater than that of the placebo group are included. Cluster Headache: In the controlled clinical trials assessing the efficacy of sumatriptan injection as a treatment for cluster headache [see Clinical Studies (14.2)], no new significant adverse reactions were detected that had not already been identified in trials of sumatriptan in subjects with migraine. MAO-A inhibitors increase systemic exposure by 2-fold. Therefore, the use of Sumavel DosePro in patients receiving MAO-A inhibitors is contraindicated [see Clinical Pharmacology (12.3)]. Because their vasospastic effects may be additive, co-administration of Sumavel DosePro and other 5-HT1 agonists (e.g., triptans) within 24 hours of each other is contraindicated. Cases of serotonin syndrome have been reported during co-administration of triptans and SSRIs, or SNRIs, SNRIs, TCAs, and MAO inhibitors [see Warnings and Precautions (5.7)]. Pregnancy Category C: There are no adequate and well-controlled trials of sumatriptan injection in pregnant women. Sumavel DosePro should be used during pregnancy only if the potential benefit justifies the potential risk to the fetus. 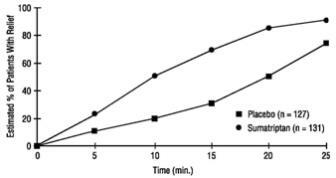 When sumatriptan was administered intravenously to pregnant rabbits daily throughout the period of organogenesis, embryolethality was observed at doses at or close to those producing maternal toxicity. These doses were less than the maximum recommended human dose (MRHD) of 12 mg/day on a mg/m2 basis. Oral administration of sumatriptan to rabbits during organogenesis was associated with increased incidences of fetal vascular and skeletal abnormalities. The highest no-effect dose for these effects was 15 mg/kg/day. The intravenous administration of sumatriptan to pregnant rats throughout organogenesis at doses that are approximately 10 times the MRHD on a mg/m2 basis, did not produce evidence of embryolethality. The subcutaneous administration to pregnant rats prior to and throughout pregnancy did not produce evidence of embryolethality or teratogenicity. A cardiovascular evaluation is recommended for geriatric patients who have other cardiovascular risk factors (e.g., diabetes, hypertension, smoking, obesity, strong family history of CAD) prior to receiving Sumavel DosePro [see Warnings and Precautions (5.1)]. The effect of severe hepatic impairment on Sumavel DosePro metabolism has not been evaluated. Sumavel DosePro is not recommended for use in patients with severe hepatic impairment [see Clinical Pharmacology (12.3)]. The elimination half-life of sumatriptan is about 2 hours [see Clinical Pharmacology (12.3)], and therefore monitoring of patients after overdose with subcutaneous sumatriptan should continue for at least 10 hours or while symptoms or signs persist. It is unknown what effect hemodialysis or peritoneal dialysis has on the serum concentrations of sumatriptan. Sumatriptan is the active component of Sumavel DosePro. Sumatriptan binds with high affinity to human cloned 5-HT1B/1D receptors. Sumatriptan presumably exerts its therapeutic effects in the treatment of migraine headache by binding to 5-HT1B/1D receptors located on intracranial blood vessels and sensory nerves of the trigeminal system. Blood Pressure: Significant elevation in blood pressure, including hypertensive crisis, has been reported in patients with and without a history of hypertension [see Warnings and Precautions (5.8)]. Absorption and Bioavailability: Sumavel DosePro is bioequivalent to sumatriptan needle-based injection via autoinjector at the thigh and abdomen administration sites. A sub-optimal dose may be delivered when administered to the arm and therefore, the arm is not recommended as a site of administration. Pharmacokinetic parameters following a 6 mg subcutaneous dose of Sumavel DosePro into the thigh were determined in 32 subjects (males and females). The maximum serum concentration (Cmax) (mean ± standard deviation) was 71.9 ± 14.4 ng/mL; the time to peak concentration (Tmax) was 12 minutes after dosing (range, 4 to 20 minutes); and the terminal half-life was 103 ± 22 minutes. Pharmacokinetic parameters following a 6 mg subcutaneous dose of Sumavel DosePro into the abdomen were determined in 35 subjects (males and females). The maximum serum concentration (Cmax) (mean ± standard deviation) was 78.6 ± 17.3 ng/mL; the time to peak concentration (Tmax) was 12 minutes after dosing (range, 6 to 20 minutes); and the terminal half-life was 102 ± 12 minutes. Distribution: The bioavailability of sumatriptan via subcutaneous site injection to 18 healthy male subjects was 97% ± 16% of that obtained following intravenous injection. Protein binding, determined by equilibrium dialysis over the concentration range of 10 to 1,000 ng/mL, is low, approximately 14% to 21%. The effect of sumatriptan on the protein binding of other drugs has not been evaluated. Metabolism: In vitro studies with human microsomes suggest that sumatriptan is metabolized by MAO, predominantly the A isoenzyme. Most of a radiolabeled dose of sumatriptan excreted in the urine is the major metabolite indole acetic acid (IAA) or the IAA glucuronide, both of which are inactive. Elimination: After a single 6 mg subcutaneous dose, 22% ± 4% was excreted in the urine as unchanged sumatriptan and 38% ± 7% as the IAA metabolite. Special Populations: Age: The pharmacokinetics of sumatriptan in the elderly (mean age: 72 years, 2 males and 4 females) and in subjects with migraine (mean age: 38 years, 25 males and 155 females) were similar to that in healthy male subjects (mean age: 30 years). Hepatic Impairment: The effect of mild to moderate hepatic disease on the pharmacokinetics of subcutaneously administered sumatriptan has been evaluated. There were no significant differences in the pharmacokinetics of subcutaneously administered sumatriptan in moderately hepatically impaired subjects compared with healthy controls. The pharmacokinetics of subcutaneously administered sumatriptan in patients with severe hepatic impairment has not been studied. The use of Sumavel DosePro in this population is not recommended [see Use in Specific Populations (8.6)]. Drug Interaction Studies: Monoamine Oxidase-A Inhibitors: In a trial of 14 healthy females, pretreatment with an MAO-A inhibitor decreased the clearance of sumatriptan, resulting in a 2-fold increase in the area under the sumatriptan plasma concentration-time curve (AUC), corresponding to a 40% increase in elimination half-life. Corneal Opacities: Dogs receiving oral sumatriptan developed corneal opacities and defects in the corneal epithelium. Corneal opacities were seen at the lowest dosage tested, 2 mg/kg/day, and were present after 1 month of treatment. Defects in the corneal epithelium were noted in a 60-week study. Earlier examinations for these toxicities were not conducted and no-effect doses were not established; however, the relative exposure at the lowest dose tested was approximately 5 times the human exposure after a 100 mg oral dose or 3 times the human exposure after a 6 mg subcutaneous dose. In controlled clinical trials enrolling more than 1,000 subjects during migraine attacks who were experiencing moderate or severe pain and 1 or more of the symptoms enumerated in Table 3, onset of relief began as early as 10 minutes following a 6 mg sumatriptan injection. Lower doses of sumatriptan injection may also prove effective, although the proportion of subjects obtaining adequate relief was decreased and the latency to that relief is greater with lower doses. In one well-controlled study, 6 different doses of sumatriptan injection (n = 30 each group) were compared with placebo (n = 62), in a single-attack, parallel-group design, the dose response relationship was found to be as shown in Table 2.
c Includes patients who may have received an additional injection of the assigned treatment (placebo or sumatriptan 6 mg) 1 hour after the initial injection. Subcutaneous sumatriptan also relieved photophobia, phonophobia (sound sensitivity), nausea, and vomiting associated with migraine attacks. The efficacy of sumatriptan injection was unaffected by whether or not the migraine was associated with aura, duration of attack, gender or age of the subject, or concomitant use of common migraine prophylactic drugs (e.g., beta-blockers). The efficacy of sumatriptan injection in the acute treatment of cluster headache was demonstrated in 2 randomized, double-blind, placebo-controlled, 2-period crossover trials. Subjects aged 21 to 65 years were enrolled and were instructed to treat a moderate to very severe headache within 10 minutes of onset. Headache relief was defined as a reduction in headache severity to mild or no pain. In both trials, the proportion of individuals gaining relief at 10 or 15 minutes was significantly greater among subjects receiving 6 mg of sumatriptan injection compared with those who received placebo (see Table 4). a The figure uses Kaplan-Meier (product limit) Survivorship Plot. Subjects taking rescue medication were censored at 15 minutes. Store at 20 oC to 25 oC (68 oF to 77 oF), with excursions permitted between 15 oC to 30 oC (59 oF to 86 oF). Do not freeze. Protect from light. Inform patients that Sumavel DosePro may cause serious cardiovascular side effects such as myocardial infarction or stroke. Although serious cardiovascular events can occur without warning symptoms, patients should be alert for the signs and symptoms of chest pain, shortness of breath, irregular heartbeat, significant rise in blood pressure, weakness, and slurring of speech and should ask for medical advice when observing any indicative sign or symptoms. Patients should be apprised of the importance of this follow-up [see Warnings and Precautions (5.1, 5.2, 5.4, 5.5, 5.8)]. Inform patients that anaphylactic/anaphylactoid reactions have occurred in patients receiving Sumavel DosePro. Such reactions can be life threatening or fatal. In general, anaphylactic reactions to drugs are more likely to occur in individuals with a history of sensitivity to multiple allergens [see Warnings and Precautions (5.9)]. Patients should be cautioned about the risk of serotonin syndrome with the use of Sumavel DosePro or other triptans, particularly during combined use with SSRIs, SNRIs, TCAs, and MAO inhibitors [see Warnings and Precautions (5.7) and Drug Interactions (7.4)]. Inform patients that Sumavel DosePro should not be used during pregnancy unless the potential benefit justifies the potential risk to the fetus [see Use in Specific Populations (8.1)]. Patients who are to self-administer Sumavel DosePro in medically unsupervised situations should receive instruction on the proper use of Sumavel DosePro from the physician or healthcare professional prior to administering for the first time. Advise patients that they will hear a click and feel a burst of air. Inform the patients that they will feel the dose being delivered. Instruct patients not to use a device if the tip of the device is tilted or broken off upon removal from packaging [see Instructions for Use]. Sumavel® is a registered trademark of Endo Ventures Bermuda Limited. DosePro® is a registered trademark of Zogenix, Inc.
©2016 Endo Pharmaceuticals Inc. All rights reserved. What is the most important information I should know about Sumavel DosePro? Certain people should take their first dose of Sumavel DosePro in their healthcare provider’s office or in another medical setting. Ask your healthcare provider if you should take your first dose in a medical setting. These are not all the possible side effects of Sumavel DosePro. Call your doctor for medical advice about side effects. You may report side effects to FDA at 1-800-FDA-1088. How should I store Sumavel DosePro? Store Sumavel DosePro between 68 °F to 77 °F (20 °C to 25 °C). Medicines are sometimes prescribed for purposes other than those listed in a Patient Information leaflet. Do not use Sumavel DosePro for a condition for which it was not prescribed. Do not give Sumavel DosePro to other people, even if they have the same symptoms that you have. It may harm them. You can ask your pharmacist or healthcare provider for information about Sumavel DosePro that is written for health professionals. What are the ingredients in Sumavel DosePro? Read these Instructions for Use which come with Sumavel DosePro before you start using it and each time you get a refill. Follow these instructions each time you use Sumavel DosePro. Before you use Sumavel DosePro for the first time, make sure your doctor shows you the right way to use it. 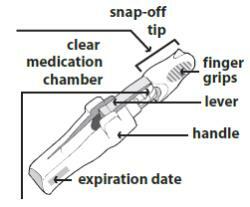 The snap-off tip should sit firmly on the end of the clear medication chamber. Do not use Sumavel DosePro if the snap-off tip is tilted or broken off. The medicine inside Sumavel DosePro should be clear and colorless or pale yellow. Do not use Sumavel DosePro if the medicine looks dark-colored or cloudy. The expiration date is printed on both the Sumavel DosePro label and carton. Do not use Sumavel DosePro if the medicine is expired. Select a delivery site such as your stomach area (abdomen) or your thigh. Do not deliver Sumavel DosePro in the arm. Your skin should be clean, dry, and free of clothing. Do not deliver through your clothes. Do not deliver into scars or moles, or within 2 inches of your belly button (navel). Do not deliver into the same spot. Change delivery sites with each use. Shaded areas show all possible areas of delivery. 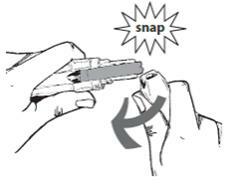 Snap: In this step, you will learn how to correctly remove the snap-off tip. Do not begin these steps until you are ready to take your dose. Firmly hold the handle of Sumavel DosePro in one hand. 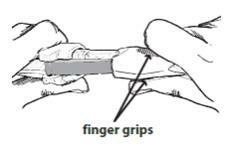 With the other hand, use your fingers to grip the top and bottom of the snap-off tip where the finger grips are located. To break off the snap-off tip, firmly snap it off in a downward motion. You may need to use some force. You do not need to twist or pull the snap-off tip; doing so will not work. 2. Flip: In this step, you will learn how to prepare Sumavel DosePro for delivery of the medicine. Firmly press the lavender (4 mg) or green (6 mg) lever all the way down (away from the clear plastic end), until it clicks and locks into the handle. You may feel some resistance – this is normal. 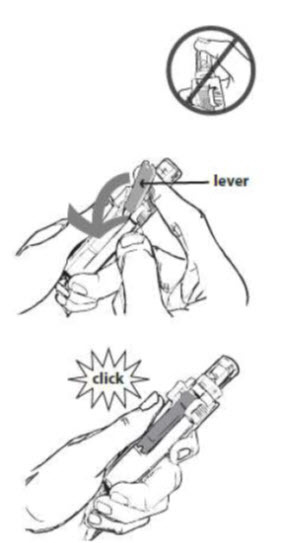 Once you have flipped the lever, do not touch the end of the clear medication chamber. Keep the medication chamber pointed away from your face or eyes. 3. Pinch and Press: In this step, you will learn how to deliver the medicine. Deliver the dose exactly as shown to you by your healthcare provider. 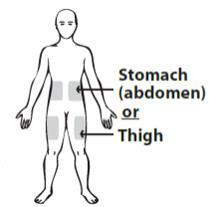 Pinch about 2 inches of the skin of your stomach (abdomen) or thigh to create a firm section of skin. Place Sumavel DosePro straight out from the delivery site with the end of the clear medication chamber against your skin. Do not hold Sumavel DosePro at an angle to your skin. During the next step, you will hear a click and feel a burst of air. Do not be alarmed. This means that the medicine has been delivered. Steadily press Sumavel DosePro straight down against your skin until you hear a click and feel a burst of air. You will feel the dose being delivered. There is no button to push. After you hear the click and feel the burst of air, the medicine has been delivered and you can remove Sumavel DosePro from your skin. Let go of your pinched skin after the medicine has been delivered. After removing Sumavel DosePro from your skin, a small droplet of blood may be present. You can gently press a cotton ball or gauze over the injection site. Do not rub the injection site. You may cover the injection site with a small adhesive bandage, if needed.